Knowing your sit bone width is important. Bought this in a 140mm width, with sit bones at 110mm and it's perfect for me. Very comfortable on long rides compared to Prologo Scratch2 PAS Saddle which is good for short crit races. A few bike fits and neumerous saddles (Specialized Romin, Toupe, Power, Power Arc, Shimano Pro Stealth) I arrived at Fizik Antares R1 Open. All previous saddles caused me pain and sicomfort. Riding was not fun. 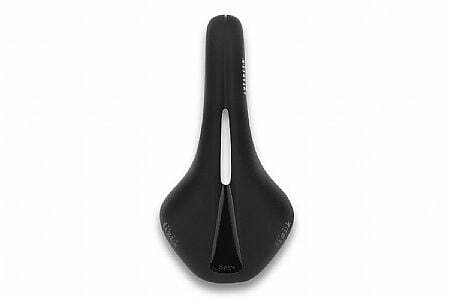 After reading a research paper on Fizik saddles conducted by Fizik in collaboration with CU Boulder, prompted me to take a chance and buy this Fizik saddle in regular size (142mm). First ride of nearly 3 hours and I am beyond happy with the the shape the padding and the non-slip textured surface....most importantly, no pain!!!! The service and the expediend delivery were a bonus in the whole experience of searching for the right saddle. Thank you Fizik and thank you Westernbikeworks! Very happy with the feel and comfort of this saddle. Had a fizik Allantra for 4 years so wanted to stay with the brand. The open channel is new to me, roughly 500 miles on it and again it feels great. So I had a Specialized Romin Evo Pro that I was fitted for, which at the time felt like a good saddle, but I didnt feel like it was a great saddle. So I had a bad crash and the seat got a little torn up, but still worked, but always want to replace it. So I saw this saddle on GCN so decided to take the plunge. Went on the Fizik website and entered in the information and was told this saddle is best fit for me. Ordered this saddle and wow is this saddle way more comfortable. Very impressed with the quality and fit. If you like the standard Antares you'll love the new cutout design. My only complaint was about some occassional pressure points. This has been addressed and it's been great. Size 143mm.